Pirate Slots | Read 2019 Review & Claim The Best Bonus! Pirate Slot is a brand new platform that offers more than just the ordinary. The platform is a brand new addition from Jumpman Gaming Limited created to add to some spice to your taste of adventure and fun. Pirate Slots casino has a very stylish background. The logo depicts the unique theme of a real pirate with a skull and two swords. For players that are quite familiar with the adventures and dealings of a real pirate, there is no doubt that you will feel the excitement of what Pirate Slots has to offer. Hence the platform has lots of thrilling slot games; Bingo games; live dealers and other cool categories of games. Also, the platform does not keep the loot all to them. Hence, members of Pirate Slots are treated to several bonuses and promotions after each successful trip. The journey ahead is only for the brave heart. Hence, Pirate Slots takes it time to collect players’ information to ensure that they meet their requirements. However, this process is as brief as possible. The registration process only takes a few minutes, and you are on board for a life of fun and adventure. To ensure that you are ready for the task ahead, Pirate Slots require that new players show some level of commitment in the form of making a deposit. The minimum deposit is ₤10. Once done, you are officially welcomed onboard by the captain of Pirate Slots. However, to get a chance to spin the mega reel, you need to step that up to a minimum of ₤20. The welcome bonus varies from a ₤10 Amazon voucher to as much as 500 extra spins. Pirate Slots offers the generic Jumpman Promotions. However, Pirate Slots provides a little more than what it used to be. Hence, you can check out some of its promotions. Lucky Loot: Since you would be spending most of your time on open waters gathering loots, Pirate Slots offers a special reward for your hard work. Hence, for every third ₤20 deposit that you stake in one day, you will receive a Loot Chest. The content of the loot chest varies from 15 to over 100 extra spins. This depends on the amount of money that you spend in one day. Every loot chest must be claimed on the same day else it will be revoked. Happy Hour: Stand a chance to win up to 500 extra spins when you play between 3-7pm on Wednesdays. Daily Cashback: It is always a win-win for everyone at Pirate Slots with the Daily cashback promotions. Pirate Slots Casino offers an exclusive VIP scheme at five exciting levels. Newbie: At Pirate Slots, everyone is unique including a newbie. Hence, newbies are entitled to receiving some extra spins and a special reward on their birthday. Expert: To qualify as an expert, Pirate Slots require players to get 101 to 1000 kudos. Legend VIP: This is the peak of the VIP ladder. It requires more than 5000 kudos to get to this level. 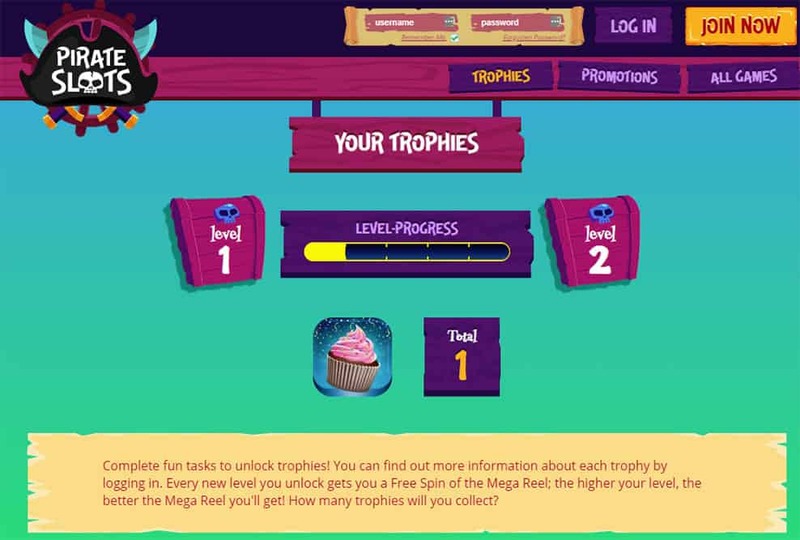 Generally, each level has so many exciting rewards. It is important to note that just as players get promoted from a lower level to a higher VIP level; it can also go the other way round. Hence, players must always meet the minimum requirements for each level to maintain their status. All extra spins for VIP status are still subject to maximum conversion of ₤250. Every single game at Pirate Slots represents a thrilling adventure. Whether you chose to play video slots; enjoy the joy of screaming “bingo” when you get the numbers right; or the immersive action of live dealers, Pirate Slots has so much to offer. The platform has a selection of games from top developers such as Evolution gaming; IGT; NetEnt; Microgaming; Jumpman Slots; WMS; Quickspin; Yggdrasil; Konami etc. Some of the newest addition to the collection of games at Pirate Slots include Cosmic Fusion; Queen of Thrones; Rocket men; Exotic Cats; Rainbow Riches; Exotic Cats; Penguin City; Madame Destiny; Light Racer; Lucky Wizard; KGB Bears; Cosmic reels; Dragons Luck and many. The games are arranged in categories. Likewise, players have the options to use the quick search option to find their preferred games. Sometimes, players could get drowned in the open waters as they search for hidden treasures. If at any point in time there is a need to quit or take a break. So far, Pirate Slots has measures set aside to foster responsible gaming. Self-exclusion: If at any point in time you feel that you are drowning, Pirate Slots offers you the option to take a break. Hence, send a mail to support@pirateslots.com with instructions on how long you would like to exclude yourself from gambling. The minimum time for self-exclusion at Pirate Slots is six months. After the set period, the account would not be activated automatically unless until the player sends an instruction for reactivation of the statement. Reality Check: sometimes, the fun gets so immersive that some payers get to forget how much time they have allotted to gambling. By using the reality check at Pirate Slots, players will receive notifications/reminders at intervals. Pirate Slots has a team of professionals that can be contacted via email and live chat. The support team is only available during working hours on weekdays. This means that you are on your own if you decide to go on raid all by yourself. Similarly, while the email support is open to everyone, the live chat is only available to registered members. Somehow, that’s cool to protect the interest of registered members. Pirate Slots has several payment methods. Most payment methods are not available in all countries. Likewise, they have different terms and speed. Hence, players are advised to understand these differences before choosing a particular payment method. In the end, all payments are left pending for about 48 hours before the status changes to processing. It takes another 24-72 hours for players to receive their payment request. Pirate Slots has lots of cool stuff to offer both new and old players. Likewise, the platform has an important wagering requirement of 65 times the bonus amount. Also, bonuses have a maximum conversion of ₤250 while extra spins have a maximum conversion of ₤8 per 10 turns. For players that are familiar with Jumpman brands, these may sound familiar. However, Pirate Slots offers some cool promotions such that everyone always stands a chance to win. Read all about this new brand on their official webpage here.